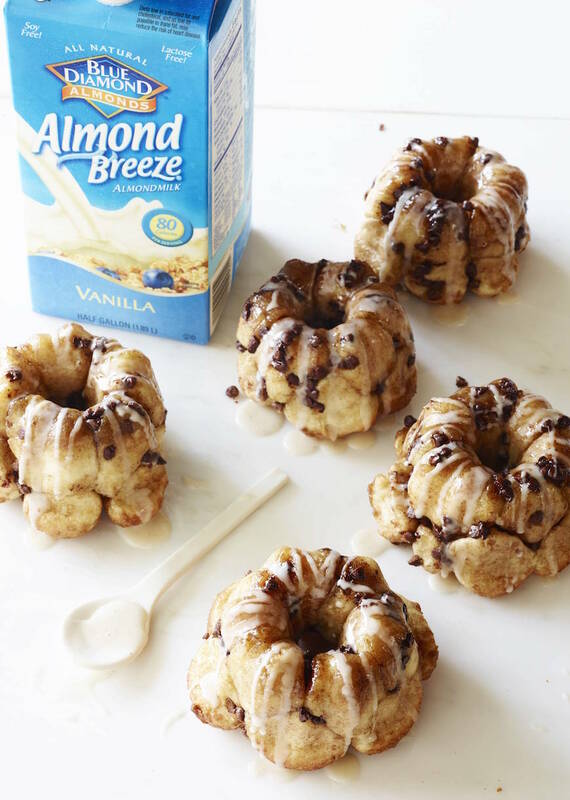 It’s been a hot second since we’ve made Monkey Bread here on What’s Gaby Cooking and it’s time for a dose of goodness in the form of this Chocolate Chip Monkey Bread with a Almond Vanilla Glaze! Preheat oven to 350 degrees F. Bake until the top is deep brown and caramel begins to bubble around the edges, about 25 minutes. Cool in the pan for 5 minutes, then turn out onto a platter and allow to cool, about 10 minutes. These look so good! love that they are minis! This is definitely a game changer! Can’t wait to make these little sweet babies!! Wow! This looks delicious. Can’t wait to try it out this weekend. 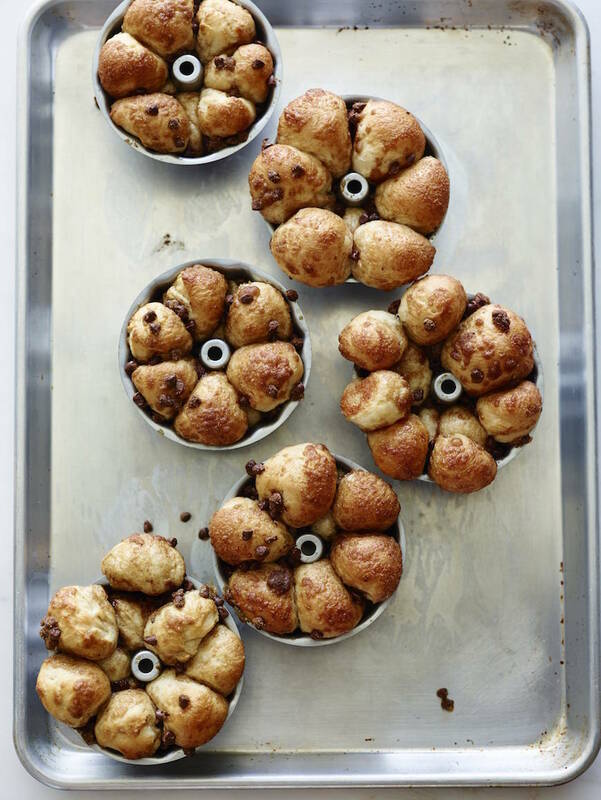 Are the chocolate chips added after the dough balls are rolled in the butter and then the cinnamon and brown sugar mixture? Love the use of almond milk here! Great idea! These look incredible!! Could you use regular milk? It looks like the recipe in your cookbook uses water instead of almond milk – I assume they both work fine? 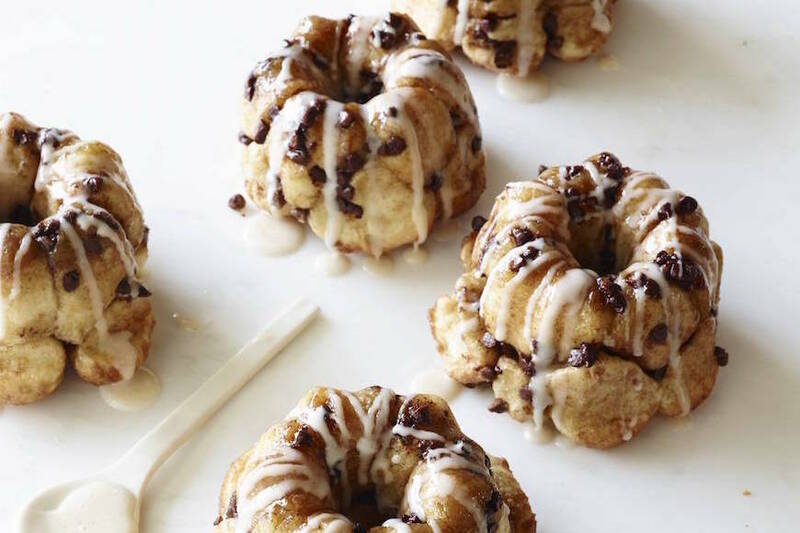 Monkey bread is a staple among our families, but adding chocolate chips just made us drool! Making this addition! Thanks! This looks amazing. It doesn’t say how many minutes to bake it. Can you guesstimate it for me. Thanks. This looks great. Can I make it in one big bundt pan? Also is there any part you can prepare ahead of time or could i reheat it to serve it hot and get ahead for brunch? you can absolutely make it in 1 bundt pan but that will change the baking time so you’ll have to keep your eyes on it. 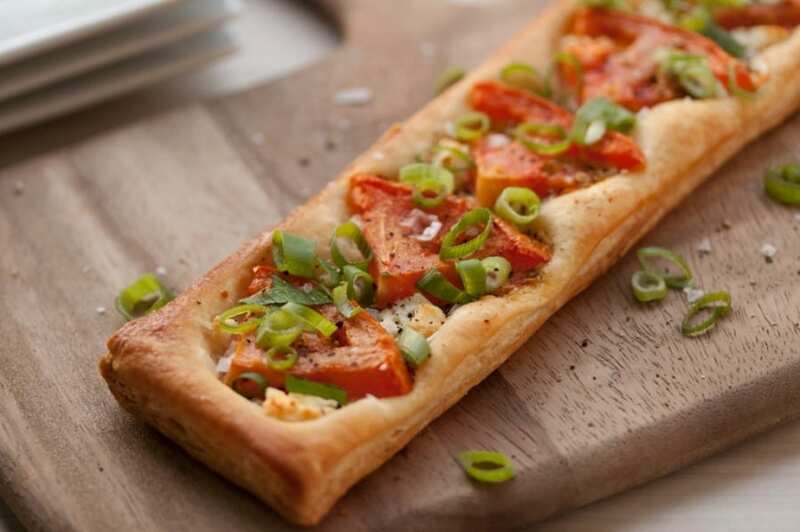 And you can prep it ahead of time and warm it up before serving – that would totally still be delish! I love everything about these and they’re all I want this morning! I haven’t tested it but I think it should work! 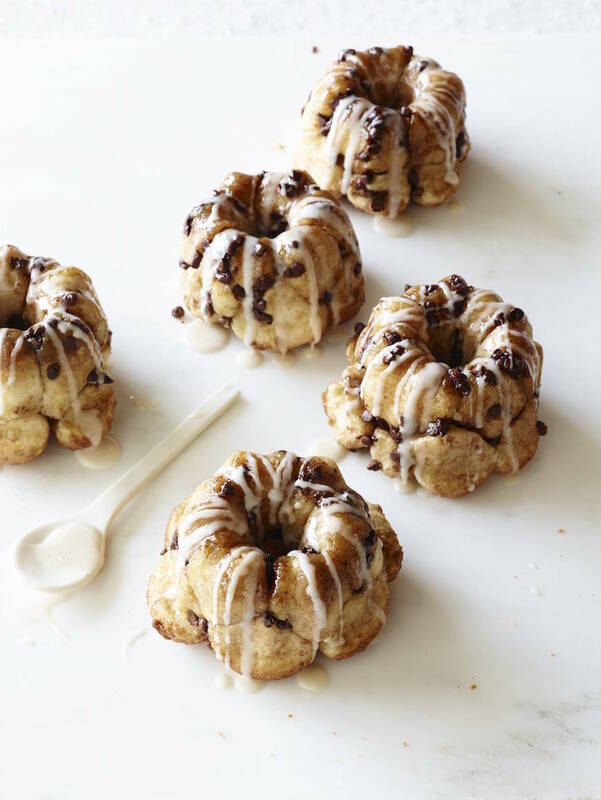 Thanks for posting a real monkey bread recipe. Whenever I Google one, they start with premade dough. Ew. 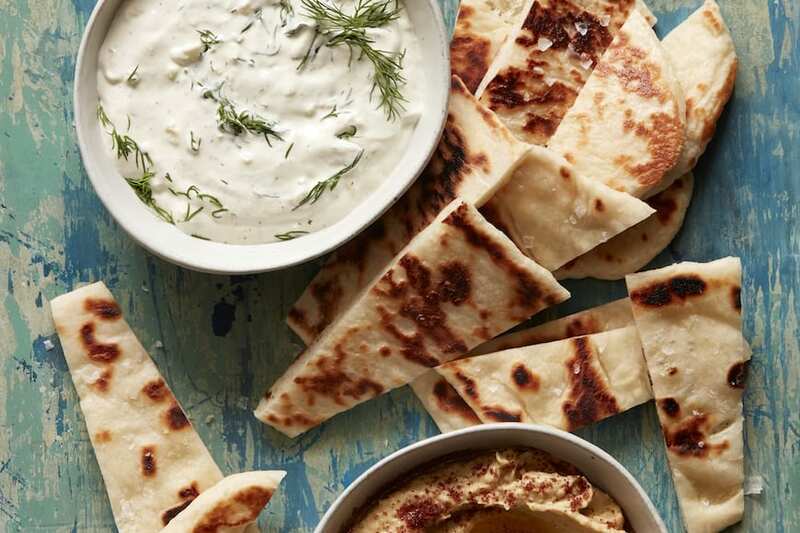 Hi Gaby…was about to make this recipe…step 5 says…cut dough into 64 pieces! That can’t be correct! Please clarify. that is correct! 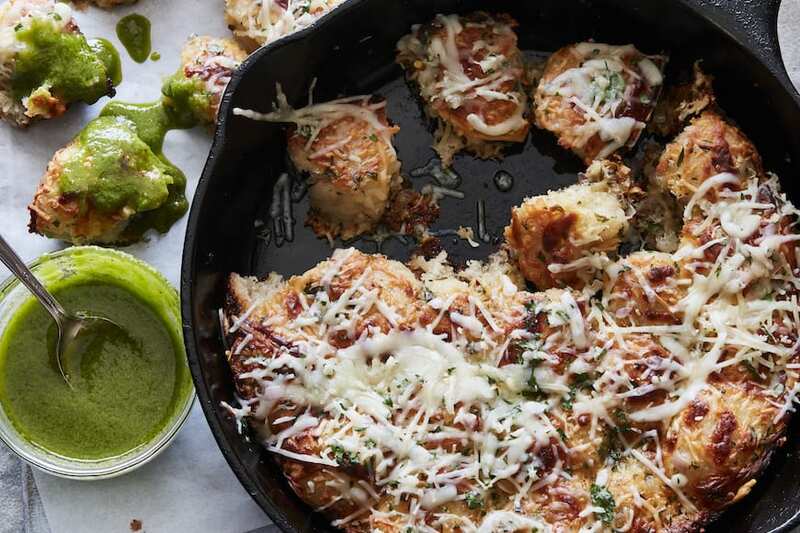 you want small pieces to make the monkey bread – so roughly 64! Can this be made in one single large bundt pan? Would the cooking time/temp change? Thank you!